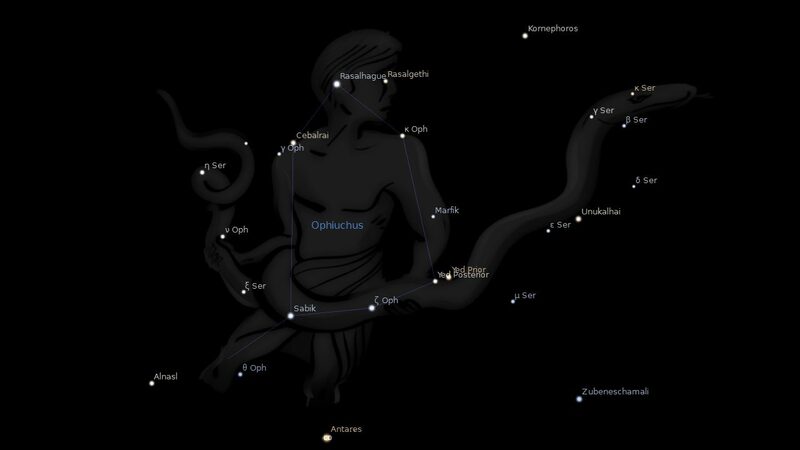 Constellation Serpens the Serpent, is a northern constellation sitting above constellation Scorpio, and in the arms of the Serpent Bearer, constellation Ophiuchus. It is split into two non-contiguous parts, Serpens Caput (Serpent’s Head) to the west and Serpens Cauda (Serpent’s Tail) to the east. Between these two halves lies the constellation of Ophiuchus the Serpent-Bearer. 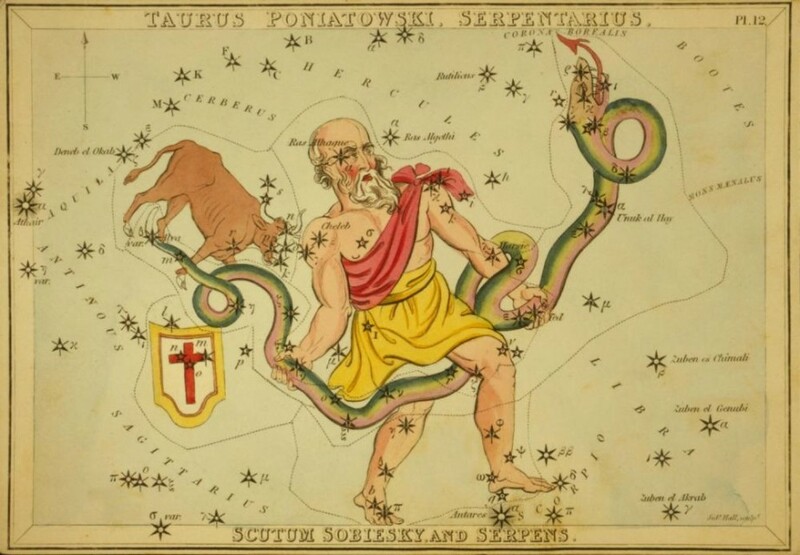 Serpens spans 60 degrees of the zodiac in the signs Scorpio, Sagittarius and Capricorn, and contains 9 named stars. Here, Serpens, the serpent, is seen struggling vainly in the powerful grasp of the man who is named O-phi-u-chus. In Latin he is called Serpentarius. He is at one and the same moment shown to be seizing the serpent with his two hands, and treading on the very heart of the scorpion, marked by the deep red star Antares (wounding). Just as we read the first constellation of the woman and child Coma, as expounding the first sign VIRGO, so we have to read this first constellation as expounding the second sign LIBRA. Hence, we have here a further picture, showing the object of this conflict on the part of the scorpion. 1. Fixed Stars and Constellations in Astrology, Vivian E. Robson, 1923, p.62. 2. Astronomica, Manilius, 1st century AD, p.31. 3. Star Names: Their Lore and Meaning, Richard H. Allen, 1889, p.374-375. 4. The Witness of the Stars, E. W. Bullinger, 10. Serpens (the Serpent).